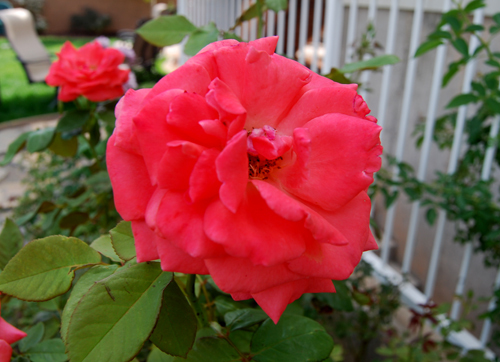 There is something uniquely sentimental about roses. They are beautiful, intricate and vibrant but at the same time they are strong and powerful. 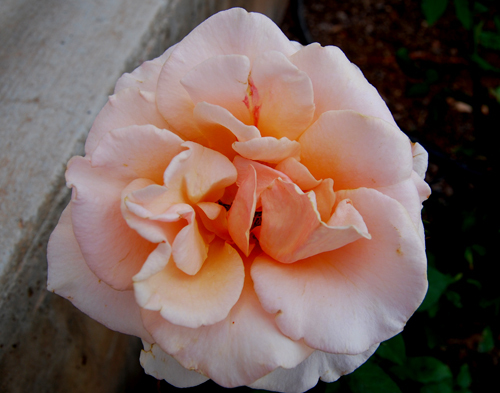 I love the rich darkness of the hot pink rose as well as the pallid purity of the peach rose. 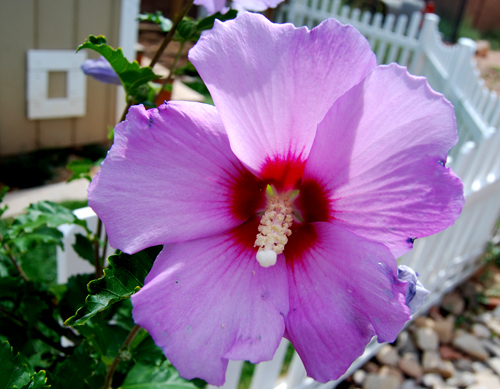 Last summer while visiting my sister in law in northern Utah I saw dozens of homes with Hibiscus plants that were 7 to 8 feet tall and the blossoms were nearly 12 inches in diameter (Rubrum). I just HAD TO HAVE ONE!! Luckily we drove by a nursery that had just what I was looking for. Even though I really didn’t have room in my car for plants I squished my kids and bags together and brought home two Hibiscus Syricus trees and one Hibiscus Mutabilis Rubrum. I worried all throughout the months of April, May and June that all three of them had died but it appears they are just late risers. 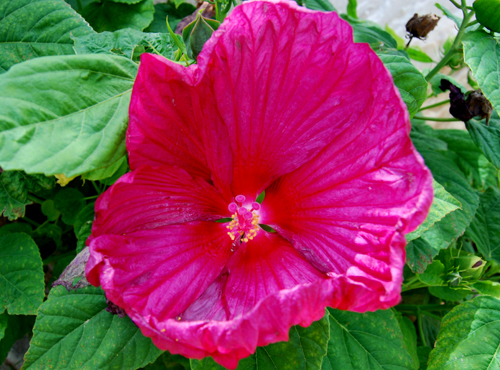 My three hibiscus are alive and well! I fell in love with Zinnas when I was dating my Husband. 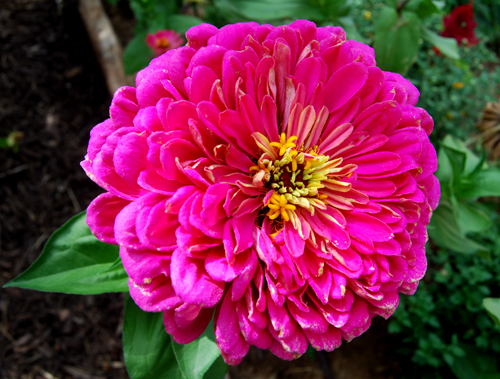 We were visiting his parents and his mother had planted Zinnia Elegans all along the edge of her garden. They were three feet tall and had the most beautiful blossoms. Failure greeted me at every door when I tried growing Zinnias from seed. I tried finding this same tall variety at the local nurseries but was never successful until this year. All I can say is that I hope I can continue to buy these breathtaking flowers in the future; they make a powerful statement in the yard (with color all summer long), and they are the perfect cutting flower (I have one on my kitchen counter that I cut almost 2 weeks ago!). A few year ago while visiting my paternal grandmother my sister-in-law commented on Grandma’s beautiful “fake flower that looks so real”. The bold yellow Dinner Plate Dahlia was very real, literally as large as a dinner plate and magnificently stunning. 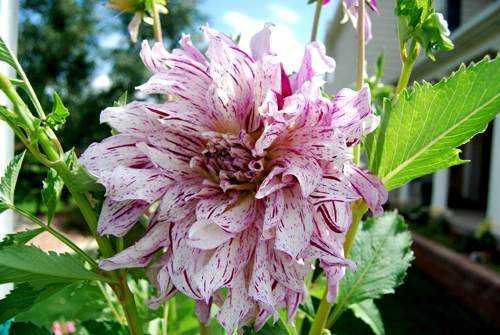 I have been waiting patiently all summer for my Bristol Striped Dinner Plate Dahlia to finally bloom. 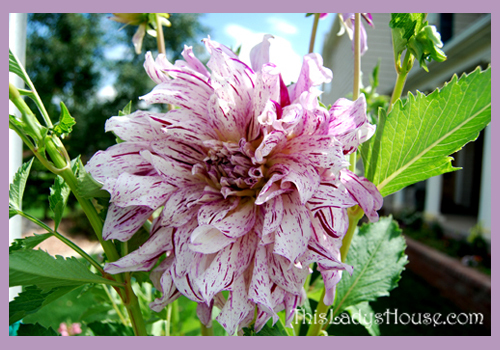 I love, love, love dahlias but, unfortunately, they are late summer bloomers so the frost typically gets them before they are ready to fall.